Vinod Bidwaik : Are you a right follower? Functional expert: We hire people for their knowledge and skills. Their functional expertise is important. But at managerial position, employee has to play different roles. If the person is in finance, he is expected to be the expert in finance and it is applicable in all functions. Administrator: Managers need to plan activities, assign tasks to sub-ordinates and get the job done. Staffing, planning, coordinating and executing are his common duties. Sometimes, he sanctions leaves, plan his manpower and archives his targets. This is administrative role he plays. Most of the times above two roles are considered. Managers are expected to perform above two roles effectively and they are evaluated based on above dimensions only. However other two dimensions and roles of the managerial disposition are always ignored that these two dimensions are leadership and followership. Leadership: Leadership is important and must be focused well, but we should also understand the personality limitations of leadership. At specific roles, always try to develop the person as leader. Coaching and mentoring help a lot here. Most of the time we give the weightage to the leadership, but followership is grossly neglected. In the organization everybody has to follow certain things. Managers follow top managements philosophy. Everybody in the organization is independent and also accountable for each other. Juniors (by position) are more dependent and also accountable to seniors (by positions). Hence juniors are expected to follow the strategy, vision, mission and instructions, directions thereby. Even if the person is not manager, most of the times he is expected to play the role of follower. And hence right perspective to the followership is needed. Kelly and Robert (1992) explained in details this followership model which I really like. 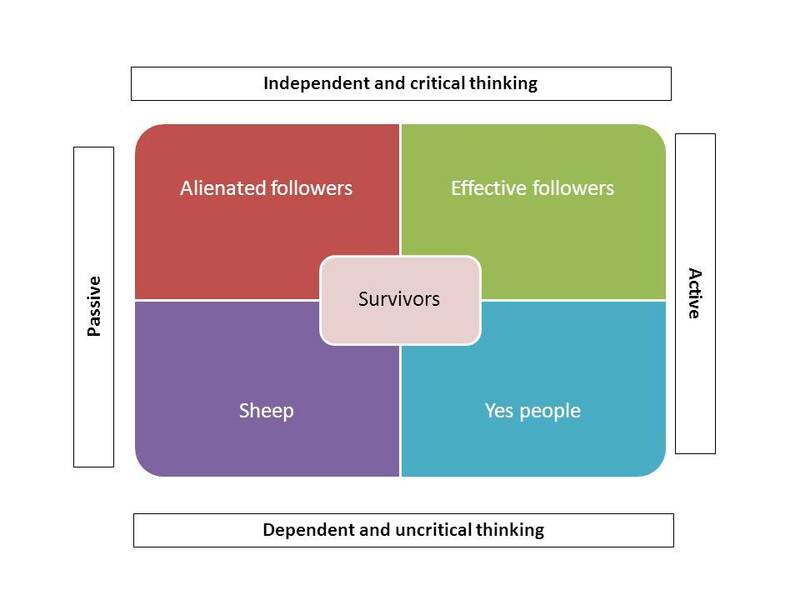 This is two dimension- model for followership behaviour. There are active and passive employees and other hand they are dependent & uncritical and independent & critical. We have the choice what type of behaviour we would like to model. Based on this there are four types of followers. 1. Sheep: Haven’t you seen the people who are like sheep? They don’t use their brain. They are passive and uncritical. They do not play an active role at all. They simply comply with any order given. They are not even Yes Boss people. They are disengaged. “you tell what I should do” is the common reaction from them. 2. Yes People: Only one good thing is these people are active. They are energetic but don’t use their brain. They are active and uncritical. You must have seen the people who readily carry out orders uncritically. These people’s behaviour can be dangerous if orders contradict standards. These are the people who always say what they think leaders want to hear. 4. Alienated followers: One good thing is that these people are critical thinkers but don’t take in right perspective. They are disengaged and passive in nature. They will ask questions, challenge and always critical but will not offer any support. 5. Effective followers: What we want in the organization are effective followers. These are potential leaders and experts. They are very active and other side they are also critical thinkers. They ask questions, challenge to the conventional though but will come forwards for the active support. They give the right solution to the problem. Actually ideal followers. They reflect on organizational tasks and even not hesitant to bring concerns to leader/bosses. They are energetic and proactive. They know their own limitations and their own territory but do not hesitate to go extra mile if required. Now you may have understood the different types of followership. Where you will put yourself and then your team?